TOPGREENER TU2154A USB Wall Charger Outlet charges two USB devices simultaneously without power adapters at high speeds at 4 Amp charging capacity. The smart intelliChip precisely reads the power need of your two devices to deliver optimal power accordingly without the fear of overcharging. 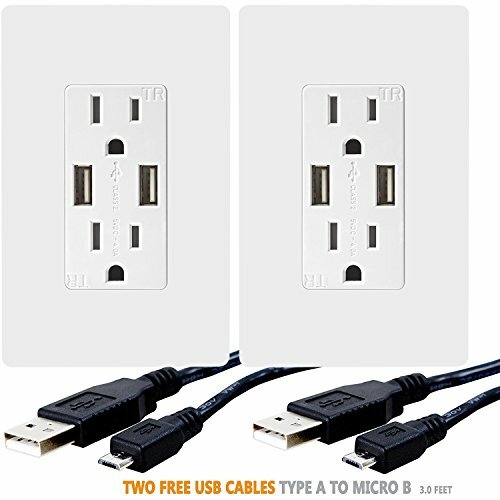 Users can charge two devices at the same time using the two USB ports and leave the two outlets free for other power needs. Featuring the highest speed of power charging for two devices at the same time, this 4.0 Amps USB Charger is one of the best-selling products for end users, contractors and commercial areas. Your iPad, iPhone, tablets, Samsung Galaxy and MP3 player now have a better power center, and your room will always look tidy and neat. Compatible with USB 1.1/2.0/3.0 devices, including iPhones, iPads, Android & Windows phones, tablets, Samsung Galaxy, Kindle, e-readers and any other USB compatible products. Top Greener TU2154A USB Wall Charger Receptacle hub can be easily installed in the wall of your bedroom, living room, kitchen, and any other room to make power charging fast, easy and convenient. This USB Charger Outlet is also great for commercial usage, including airports, hotels, restaurants, schools, offices, hospitals, etc. The receptacle is back and side wire compatible for diverse wiring needs, and fits in any standard in-wall outlet box. It is also compatible with standard size wall-plates and can be multi-ganged with other devices, such as receptacles, motion sensors, switches and Z-Wave devices. Compatible with USB power strips. Safety an important feature of TU2154A USB Charger Receptacle hub. Tamper resistant outlet features an internal shutter mechanism to protect children from sticking objects into the outlet. Perfect for any home renovation projects! High speed charging is more convenient and efficient than ever! The outlet complies with 2011 National Electrical Code (NEC) requirements and is UL Listed.